Seems the latest food trend is food trucks, more specifically gourmet food trucks. Or as one San Fransisco owner calls his, "mobile bistro." From LA to Austin to NYC, dozens of urban, hip food trucks are charming epicureans with fare ranging from duck dumplings to pavlova with red fruit gelée. Hotdogs and hamburgers have been usurped by their more politically correct cousins, organic free-range chicken and grass-fed beef. But what about the old food trucks and carts? You know the ones -- the quintessential LA taco trucks and the hot pretzel carts run by a gruff guys named Sully or Bobby. Are they being squeezed out? Last March in East LA, Mexican food truck owners, under fire from restaurants who claim they're hurting business, began a campaign called "Save Our Taco Trucks." Personally, I'd like to see both camps succeed. Because, let's face it, getting affordable, healthful, organic meals from a food truck is terrific. So is getting an artery clogging carne asada (marinated steak) torta when the craving strikes. I don't remember the name of the taco truck in LA where I tasted my first torta, but I do remember it was very late, I was very hungry, and the food was very good, soul-soothing good, actually. 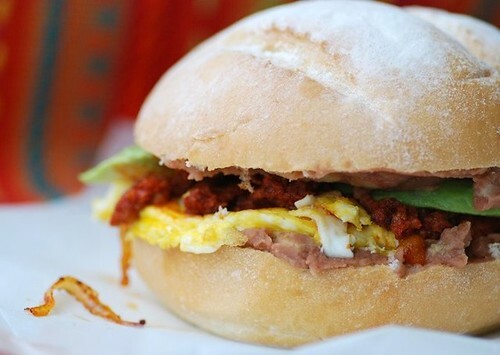 A torta is a popular Mexican sandwich consisting of a split telera roll that is packed with any of various fillings ranging from meaty chorizo and pulled pork to vegetarian-friendly eggs and beans. In the US tortas have been called "American hoagies," "Mexican hamburgers," and "tacos on a bun." They're none of those; they are tortas, Mexico's beloved sandwich that comes in numerous regional variations. Like all quintessential Mexican street food, tortas are cheap, fast, and filling. They're also the new "It" sandwich if you trust author JJ Goode of Details magazine; he recently rung the death knell for the panini and bahn mi and christened the torta the "new best sandwich contender." 1. Go to a Mexican market, and buy a good telera roll -- a big, round, flat, mildly-crusty roll. (Bolilos are similar, but oblong in shape). Don't have a Mexican market? Use a Kaiser roll instead. 2. Choose your favorite filling -- maybe ham, chorizo, steak, fried fish -- and pile a lot of it on your telera roll. Lift the sandwich. It should be heavy and require two hands; if it doesn't, then add more filling. 3. Garnish the sandwich with a few toppings. Lettuce, tomato, and cheese are optional, but avocado, refried beans, and hot sauce must be included. Period. 4. Grab a big stack of napkins, a cold Dos Equis, and your oversized torta, then find a comfy chair. 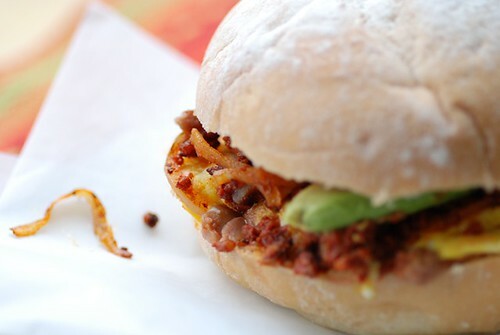 Plop yourself down on it, embrace your torta with two hands, and eat until your stomach hurts. This breakfast torta pairs well a glass of freshly squeezed orange juice and a big mug of strong coffee. Of course, I wouldn't stop you from enjoying it with a cold Dos Equis. 1. In a large skillet over medium heat, warm oil. Add onion and chorizo, and sauté for about 5 minutes, or until meat is browned and crisp. 2. In a small bowl whisk eggs, salt, pepper, and hot sauce. Add to the skillet; stir frequently until eggs are cooked through yet still soft. 3. Place telera roll on a clean work surface. Spread both halves with Mexican crema. On the bottom half of the roll add refried beans; top with chorizo and egg mixture and fresh avocado slices. Serve immediately. Mexican crema is a Mexican sour cream which is available in the refrigerator section of Mexican specialty markets as well as many major supermarkets. Regular sour cream is a good substitute. Telera are available at Mexican specialty markets. A Kaiser roll or a soft crusted baguette are good substitutes. Oh my goodness that looks amazing. I've never been to LA, but when the day comes I plan to take a tour of taco trucks and mobile bistros. My kind of street food. Yes, we love truck food in NYC. And, I would not complain if one drove up and handed me a torta! That is quite the sandwich! Yum, yum! I wish a sandwich truck would cruise our neighborhood instead of the ice cream truck. I'd be all over that sandwich! I can't say I have ever had a sandwich from a truck, but I would like to try one now! I have, of course, had a hot dog from Haven Brothers! Remember them? P.s. thanks for your kind words about my mom and sorry to make you home sick...You'll have to come home and visit soon! Oh, yummy! That look soooo scrumptious and hearty! Oh my goodness!! That looks delicious but that sandwich is enough to feed an army!!! Oh my thats really one big sandwich...hmm looks tempting! what I would or could give for a torta in this moments of my life.....and you know in Mexico chorizo and egss torta is THE torta!. Oh my goodness this is one very impressive sandwich - YUM! For Rhode Island readers, try the Dominican trucks on Broad Street in South Providence for their version of tortas. Delicious! Oh I wish we had trucks like that here! Guess I'll have to make my own. What a fun twist on breakfast. I LOVE tortas. This sandwich looks so great! Man oh man, I want this right now, Susan! You should probably specify that you use Mexican chorizo for this. It's made of ground pork and is quite different from Spanish chorizo, which is made from roughly chopped pork and heavily seasoned with paprika. Hard to resist egg, chorizo AND a big bun. Looks gorgeous, the next time I am feeling ravenous this will be my salvation. love it! you beat us to it, susan. this was on our list to make before summer's end. we have a place in our hood that makes AWESOME tortas. they are my guilty pleasure for lunch when i'm either hungover or just wanting to indulge. SO good. i take it this one is for the book? very delish! This sandwich looks delicious...this will be on my sandwich to try list! Wish we had a truck here. When done right, a torta can be delicious! The best torta I've ever had was from Frontera Fresco (smaller more casual Frontera restaurant by Rick Bayless) - their steak torta is killer! What I would give to have a good Taco Truck anywhere near me! Or even a bad one. I guess I'll have to settle for this sandwich. It looks totally delicioso! I would never have known about this if you hadn't shared, so thanks! We spend a lot of time in Austin so I'll have to look for some *mobile bistros* next time we go there. Mmmm chorizo! There's no reason not to love this. That is one tasty sounding breakfast sandwich! andrea-That sounds like a plan! tw-No kidding. I'd thank them profusely! karen-I know what you mean. parita-It is BIG and tempting! lydia-Thanks for sharing! I haven't eaten there before. italiandish-When I first read it, I thought you meant "truck," then I realized you meant the torta. Haha. elly-It tastes so great too! wanf-Oh, you're so right. It's an awesome late night snack. Yup, it's in the book. lynda-Now you can make your own! snooty- "Or even a bad one." I love that. Yeah, there were several in the South of Congress district when I was there in May. kevin-I'm glad you like it! Haha I love your list of how to make a great torta, especially points 2 and 3. Gorgeous pictures! I have a couple local Mexican places that serve great tortas. I might have to visit one tomorrow, come to think of it! This looks like heaven in a roll. I came to your blog from Foodie Blogroll and I'm so glad I did - I love your writing and the pictures are quite, quite delicious. I love food truck food especially the taco trucks. And this is definitely one hearty sandwich. This looks so good! I love the ingredients that go inside the torta. Thank you for the recipe! Mmm. This really looks like a winner. I agree about both kinds of mobile food succeeding...though I sort of wish the cupcake truck wouldn't park in front of my office...too tempting! abby-Oh, it's so good, I know. lickedspoon-I really appreciate that. Welcome! I'll look forward to our future visits. veron-You can't beat those taco trucks for cheap, delicious grub. susan-Yeah, there are a lot of gourmet mobile trucks now, so you'll have to check them out. maggie-Hah! I don't blame you. O wow! Now that's a huge and yummy looking sandwich!! Lovely pics Susan! After reading this I'm ready to fly to LA or to your house! That is an uber-awesome sandwich!